Most people know and love guacamole, but this version has a bit more going on. 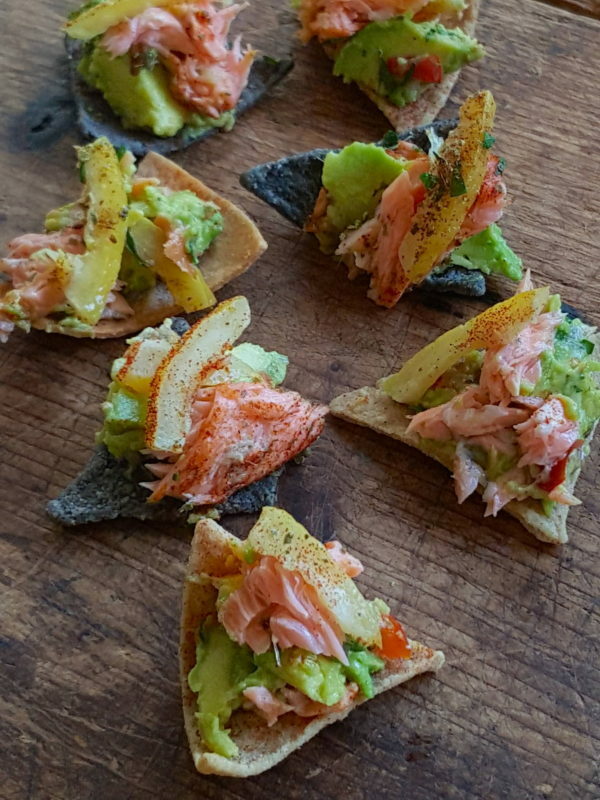 Topped with hot-smoked salmon and garnished with preserved lemon, it’s more than a snack. And if you want to be OTT, garnish it with lime fluff! 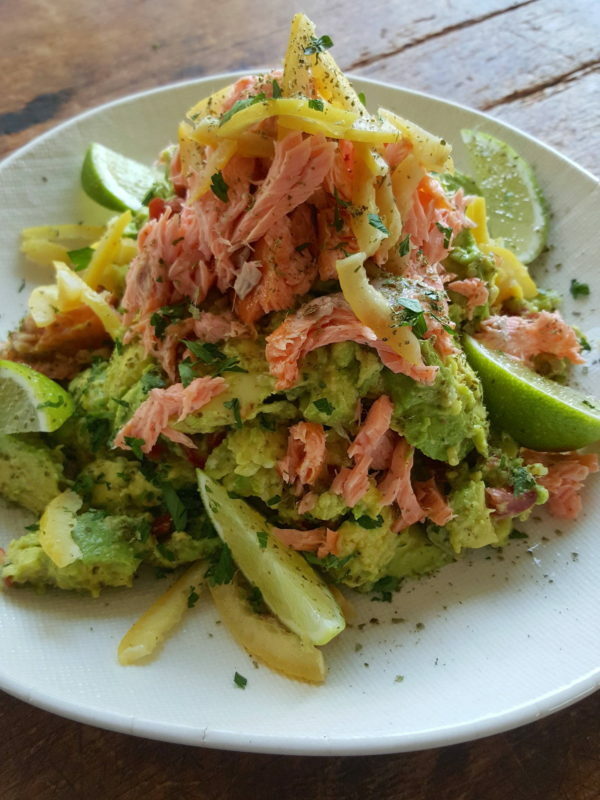 Guacamole can be made by squishing ingredients together with a fork and turning the mixture into a purée, or try this method. Mash chillies, cumin, salt and half the coriander in a mortar with a pestle (or finely chop by hand). Add avocados, lime juice, onion, tomatoes and remaining coriander and semi-smash together, leaving it lumpy. Taste and adjust lime juice, salt and chilli – it should have a good fresh clean bite. If not serving immediately, cover the surface with plastic wrap and chill. Make lime leaf fluff by slicing the spines out of the leaves. Chop leaves coarsely then process to a fluff in a spice grinder. Use the day of preparing. Mop salmon with paper towels, Peel away skin and flake flesh. Rinse preserved lemon wedges discarding flesh. Pat rind dry with paper towels and slice thinly. 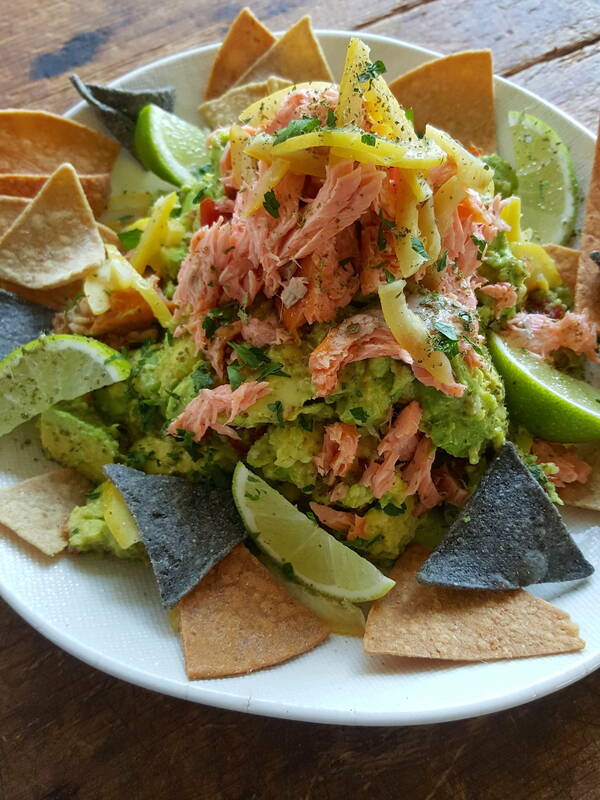 Put guacamole in a wide bowl and top with salmon and sliced preserved lemon. Sprinkle with lime leaf fluff and serve. Serve on taco chips if you want to be fancy!